As some of you may already have noticed, I’ve done some reconfiguring of my website recently. Quite a few of of my friends and neighbors have said they hate reading blogs, but that they want to know whenever one of my stories or articles is published. I’ve decided to help them out. Follow this link and you’ll see the new landing page for my website. On it, you’ll find a subscription form for an email list. This is a distinct list, separate from following my blog through Word Press. Put in your email address, name, check the box and remember to press send. Each month, I will (G-d willing) send you a free activity page, coloring page,seder song, comic or the like. The first freebie–a comic–will be out in the next day or two, I hope! You can also find the form by clicking “Welcome” on the menu at the top of this page. Feel free to spread the word! Try this wacky avatar hack! As part of a course I’m taking through Carol Tice’s amazing website Make a Living Writing, I received the following homework assignment: put an avatar up on Gravatar to pop up whenever I comment on blogs, etc. Now, I could use a photo, but that would just be no fun, so I decided to create my own Gravatar. Me, in black and white and nothing on my head to cover my hair. For shame! I started off by googling “free avatar tools” and discovered a lot of nifty links to different programs to help you make your avatar. The best site I found was Digibody. The results of a picture created with their Avatar-Maker tools look much nicer and more professional than those created with other programs, I found. The pic was black and white. I thought color might be more eye-catching and engaging. I don’t leave my house without a hat or headscarf on my head. 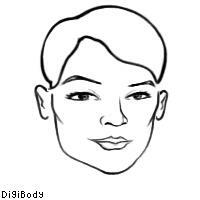 There was no way to put a hat or headscarf on the picture using Digibody’s tools. I don’t leave my bed without my glasses. (2 a.m. trips to the bathroom don’t count.) No one would recognize me without some glasses on my face. 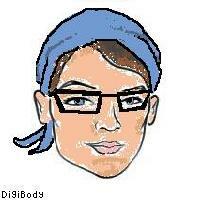 Thanks to Microsoft Paint, I added my headscarf, glasses, and a touch of color. I saved the image to as a jpeg onto my computer. Then I pulled it up in Microsoft Paint (how I wish I had Adobe InDesign or something fancier, but alas, no) and started sprucing up my avatar. This is my DIY avatar. It’s recognizably me. What do you think of the end product? I’d love some reviews in the comments. Can you trust the reviews you read? I mentioned briefly in last week’s post that authors have been hiring other writers to review their books and sometimes even to bash the competition. (This happens for reviews of all types, in fact, from hotels to toaster ovens.) Media coverage of this issue has been growing lately–see this revealing expose of the practice and this equally eye-opening explanation of how to detect faux reviews for details. Since Judaism has an idea of geneivat hadaat–misleading knowledge as a form of theft–you’d think that the Jewish book world is immune to it. However, Jewish publishers and authors do buy reviews. Often, the review appears on an “advertorial page.” Perhaps this isn’t deceptive after all–it’s marketing, not true reporting–and so permissible under law, Jewish or otherwise, but the casual reader usually doesn’t know the difference. Why is everyone making a whoop-dee-doo about this? Because people look at reviews for guidance about how to spend their money. Consumers expect reviews to be sufficiently objective to weigh the pros and cons of the product in question. Can you count on a review being objective if the author received money for it? On the other hand, if an author sends you a copy of their baby (ahem, I mean “book”), then it’s clearly hurtful to turn around and bash the book publicly. If they are making the effort to market themselves, they want to protect themselves (hence payment offered for positive reviews). I can understand that authors are afraid to gamble on whether the people they ask to read their book will heap praise on it or tear it to shreds. However, we still get knocked back to my point above–consumers expect reviews to be trustworthy. I’ve been approached recently by several different people to write reviews of their books, partly because I’m an author, partly because I’m a blogger, and partly because I (briefly) used to be paid by a magazine (not an author, not a publisher) to review books. Some have offered money, some have not. I’ve reviewed a few of these books, but I made some rules for myself so that people can trust my evaluations. Rule #1 – I will accept money from a magazine or newspaper that prints a review, but not from the author or the publisher of the book. Rule #2 – If you provide me with a free copy of your book, either in print or digitally, I will read your book. That’s all I can promise. Rule #4 – If I have more than a passing acquaintance with the author, I’ll state it in the review. I hope that others will adopt these rules, or similar ones, so that people can trust reviews again. After all, I’m a consumer, too.